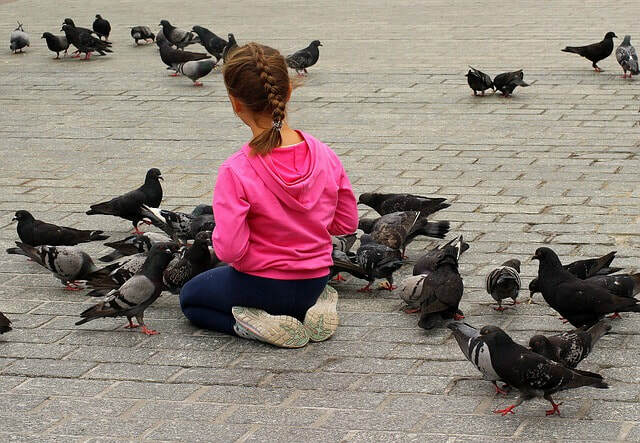 A YOUNG GIRL FEEDING BIRDS IN WINTER. Nature is harsh – people and animals suffer and starve, and they die. Yet without harshness compassion could not exist; there would be no place for it. There is no higher purpose than to live life as a constant expression of compassionate love. This is neither fanciful nor sentimental love; it is feeding the hungry stranger. Hospitality is the mystery of the mutuality of joy created by giving, where the subtle and the substantial are married together elegantly, with a delicate awareness of the importance of each of these two aspects of life. Our love for the beauty of Nature, whose power is actually often cruel and life-threatening, is hard to balance with our quite normal fears of danger. Yet for some people, there is an inexplicable force of innocence that makes them quite comfortable with the challenge of finding the balance, and usually enables them to do so. Usually the power and beauty of Nature stimulates wonder within us; this is more easily accessible to the young-minded, receptive, innocent person. The qualities of youth, and of the feminine, are more perceptive to the experience of Nature, and seem to have a more profound attunement to its mystery. 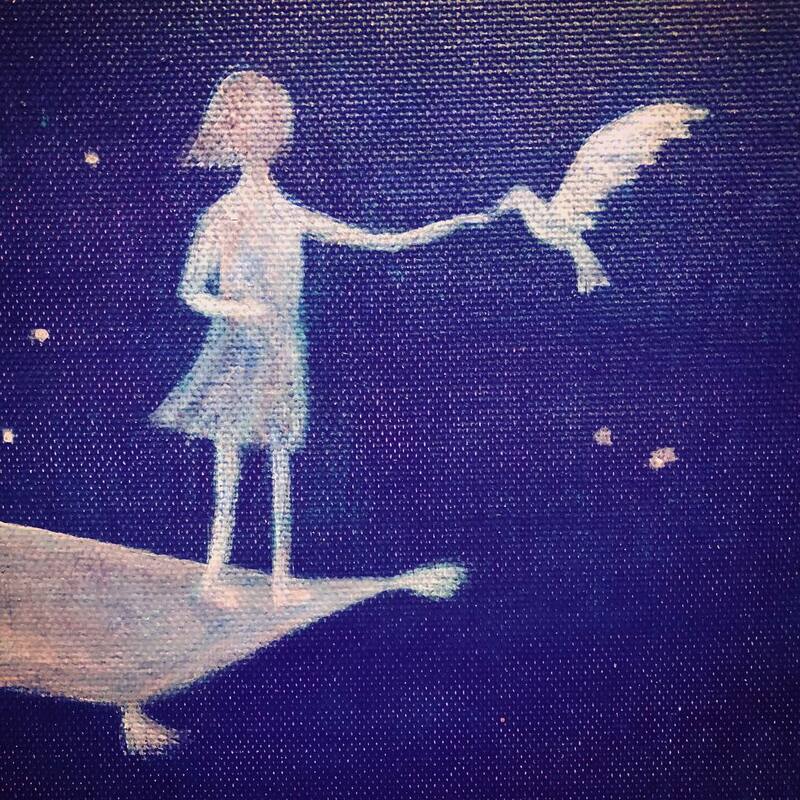 The girl does not rail against the cold, she does not wallow in useless feelings about hungry birds; she feeds them. It seems, on a surface level, that it is largely the birds that are receiving the benefits from this act of generosity; yet there is more to see. A truly significant benefit is accrued to the giver – an extraordinary power of self-assurance is enhanced by such an act. As we give to the needy, we the givers experience nourishment. If the gift is of bread alone, with a zealous do-good intention, then much is forfeited, especially if the deeper hidden intention is to win approval. This more masculine act serves quite a different purpose and has a barren quality, rather like foreign aid, whose purposes are political rather than caring. The physical item passed – bread or money – is surely better seen merely as the symbolic objectification of the actual, deeper gift of love. Our spirituality shows in the sensitivity we bring to acts of charity. The love implied by the gift has power to sustain life and hope. Trusting in Nature, in life itself, each day we see blessings all around us. As seasons change, so we flow; passion and stillness exist, so each is in our way of being; we see how abundance is sustained by the interactive flow, so we open up to receive and become conduit for hospitality and generosity. Because of its innocence and vulnerability, a baby is not without power – it strongly influences behaviours and outcomes. This is evidence of humanity’s essential goodness – we are gentle with the vulnerable, and kind to the needy, when we have no reason to be. By making themselves entirely at the mercy of others, like babies the innocent attract kindness and thereby contribute receptively to the spirit of generosity. We need to surrender to life in order to open ourselves up to participate in such generosity, either as a receiver or a giver, and trust that our own needs will be met, and that we have more than enough to share with those in need.